Valentine’s Day is tomorrow and my daughter’s school is going to have a Valentine’s Celebration. She was asked to bring a treat for her classmates and this is what I came up with. 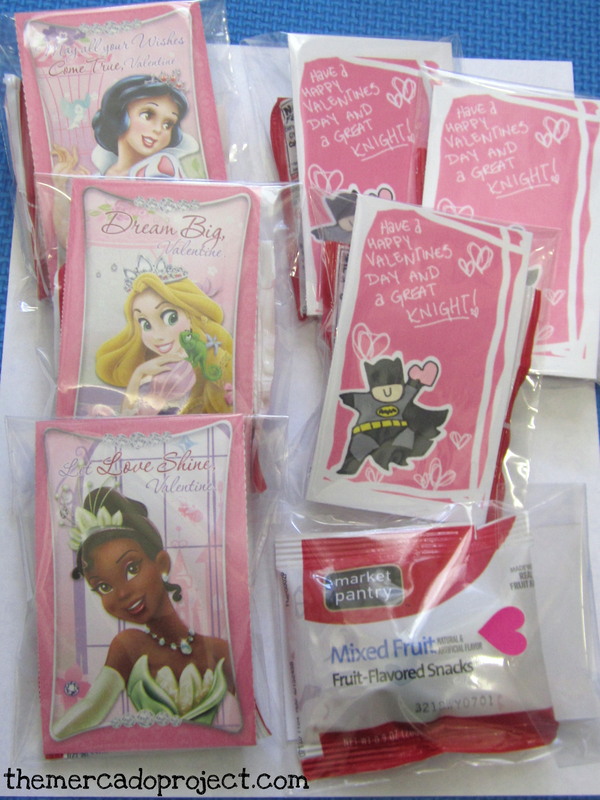 During a sale at Party City about a year ago, I came across these Princess Valentine cards. They were Buy 1, Get 1 Free so I thought, “Hey, why not? They might come in handy for the future.” Hello handy valentines, it’s the future! I packaged a princess card with a fruit snack in a candy bag and sealed it with a heart sticker that came with the cards. These are for the girls in her class because I thought it would be perfectly ok to give the princess cards to everyone in the class, but that wasn’t the case. My daughter and my husband, both, proclaimed that you couldn’t give the boys a princess card. So I asked my daughter, “Who should be on the card for the boys?” and she replied, “Batman!” Ok. I did a quick AOL search and I found this cute clip art with Batman. It does have a pink background, but I couldn’t change that and it’s still Batman. I put together a total of 21, 12 girls and 9 boys. I really hope they enjoy this treat. I’m going to change the subject now because I wanted to share a quick dialogue I had with my oldest daughter last night. She is learning our national anthem, the Star Spangled Banner, and I showed her several YouTube videos with the music and lyrics. We came across Whitney Houston’s rendition at the Super Bowl in 1991 (http://www.youtube.com/watch?v=YHmdu_I_0zI). Me: Her name is Whitney Houston. This video is old, but famous because Whitney sang the Star Spangled Banner beautifully. Unfortunately, she’s not with us anymore. Me: She had an accident and was hurt really bad. She died. Me: Yes, she was very beautiful. I know that I didn’t have to tell her that Whitney passed away, but I want her to start getting an idea of death. It’s definitely part of life and I want to introduce these aspects little by little as opposed to not having any knowledge of it at all. Since she started school, she has come home asking me and telling me about things that we necessarily haven’t spoken to her about so whenever an opportunity presents itself, such as someone who has died, I mention something so she can know a little bit of it, for now. We finished watching Whitney sing and my daughter asked to see and hear her again. I loved how she said that she was beautiful. Just like that. Through a child’s eye, we can learn so much.